This is the most famous cookie of Scotland. It’s a must to use pure butter. Traditionally, shortbread contains no other flavor. I’ve been making this recipe since 1970 when I got the recipe in Edinburgh, Scotland. The addition of a small amount of rice flour gives a firmness and crunchiness to the cookie. Most American recipes for shortbread substitute cornstarch for rice flour resulting with a less crunching cookie. Place on a floured board and roll 3/8 to 1/3-inch thick. Either cut with a small 2-inch round cookie cutter or cut with a sharp knife into small triangles or finger shapes. Place on an ungreased cookie sheet. Prick each cookie three times with a toothpick or with a fork and sprinkle sugar over the tops. Bake at 375Â° F. until edges turn faintly tan. DO NOT ALLOW COOKIES TO BROWN. Remove from oven, and while hot, sprinkle tops with more granulated sugar, if desired. Cool and store in an airtight container at room temperature. I have some rice flour, might be good to try this! 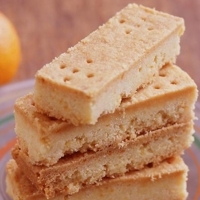 I have a weakness for Scottish shortbread, would love to try it out. love to try your recipe! looks delectable WOW! I've always wanted to bake shortbread. I like short breads. Making on my own would be awesome!